I'm still on a chocolate high since yesterday's Truffle making, so thought I'd bake some Chocolate Surprise Cupcakes, which have a great chocolate flavor and a yummy surprise inside! Cheesecake! These luscious little snacking cakes have have a moist cheesecake filling in the center and they are so rich they don't need the traditional frosting. Just give them a light dusting of powdered sugar and you're good to go. Frosting would be way to rich. There is a trick, though, to getting a smooth top on which to put that powdered sugar. 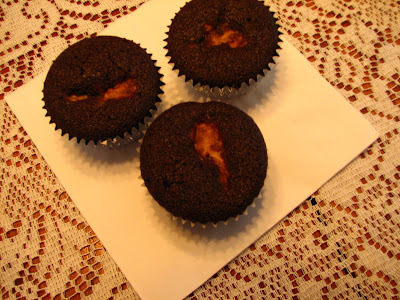 If you use too much cake batter on the bottom of the cupcake, then add a dollop of cream cheese batter, and then you maybe don't have enough chocolate batter to cover very well, you might get crevices in the cupcakes! Yea, I got some crevices. Oh well, these are snacking cakes and they don't have to be perfect, right? They are still really good. 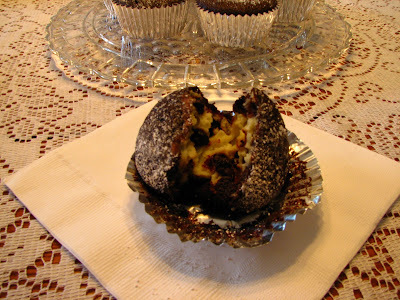 Try them, your family will love them, if they love cheesecake filling, that is. Heat oven to 350 degrees. Beat cream cheese, 1/3 cup sugar and 1 egg until smooth. Add chocolate chips and set aside. Beat the cupcake ingredients together with a wire whisk until smooth. Spoon 1/2 of the batter into 18 paper lined muffin cups. Top each with 1 Tbsp. filling. Spoon the remaining chocolate batter over each one. Bake at 350 degrees for 30-35 min. or until a toothpick inserted comes out clean. I prick 1 cupcake from each pan just to make sure the filling is done. Cool completely and then lightly dust with powdered sugar. This recipe came out of a Brand Name Bake Sale Cookbook that I purchased for my daughter a few years back. I hope all of you have a wonderful Valentine's Day tomorrow! Comments are always welcome and enjoyed! I love chocolate and cheesecake. These look delicious! 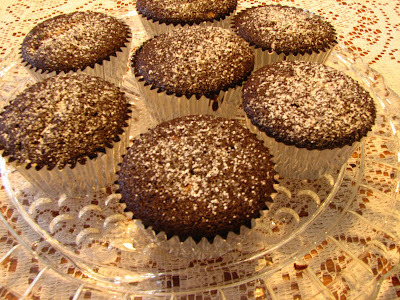 These look so good, they remind me of black bottom cupcakes, which are my favorite! Oh, I could eat one of those right now. They look incredible. Yumm. These look and sound so good. Love chocolate and cheesecake.